Sr. Sarah Jean was born in Toronto, an only child to parents from Nova Scotia. In 1950 the family moved to Marathon, Ontario, a pulp and paper town, for six years where she developed her strong love of nature and sewing. She was involved with Brownies, Guides, Sunday School and later on, church choir and teaching Sunday school in St. Patrick’s, when the family returned to Toronto, and where she met Sr. Christine and Sr. Wilhelmina of SSJD. Trained as a nurse, Sara Jean worked at Women’s College Hospital in Toronto, Victoria Hospital in London and Kitchener-Waterloo Hospital. Increasing church involvement, sewing, crochet and embroidery added to her skills. “I find it contemplative to sew – especially ripping out! It frees my mind for other things”. She has also been making Anglican Rosaries and leading workshops to teach others. Sr. Sarah Jean entered Community at age 30 and recalls “one of my happiest times was living in Edmonton for 11 years, longer than I ever lived anywhere. We had poodles and cats which I loved even though allergic to them.... I also got to know the people over time and it was enriching to be with them…. We has a great sense of being part of the Diocese, something I also experienced in Montreal” and later in Victoria. 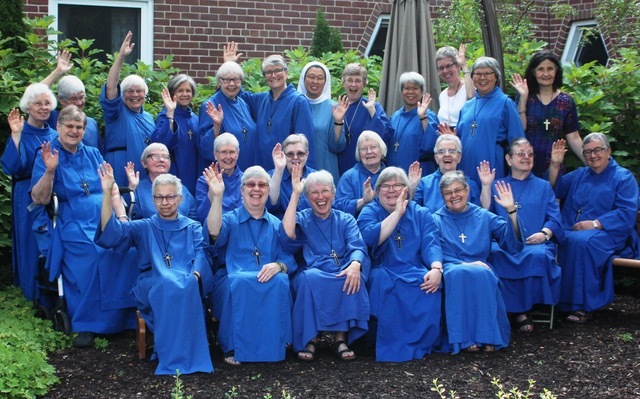 While in Montreal as Head of House, she sat on the Diocesan Committee for following up on candidates for ordination and was able to take courses in prayer companioning. Another highlight for Sr. Sarah Jean was her first directed retreat at Loyola House, “a time of spiritual renewal for me and giving a new look at what ministry means. When something affects one that much, one wants to share it”. In Victoria, she was Director of Western Associates and spoke excitedly about her new opportunities of experiencing the wild beauty of BC landscape while travelling to various communities.